Where is the New Theology Leading Us? The Structure of the Encyclical "Humani Generis"
Internet Classics Archive: Works of Plato, Aristotle, etc. Quaeritur: How are Trinitarian Processions Compatible with Divine Immutability and Eternity? Von Hildebrand... What do We Make of Him? Abstract: In St. Dionysius, the procession of things from, and their reversion to, the One, far from being distinct and clear-cut events, can be understood as intertwined, simultaneous, and co-eternal ‘moments’ of the same cosmic reality, whereby a given thing oscillates, or spirals, between unity and multiplicity. 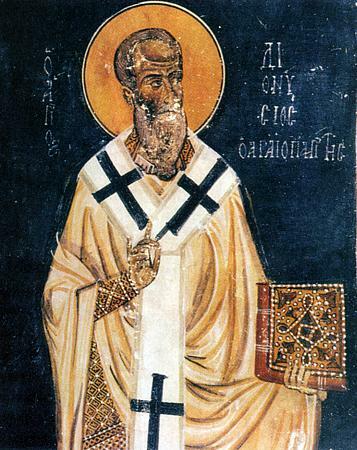 Moreover, St. Dionysius’ mystical itinerary is a special case of his procession-reversion metaphysics: mysticism is the soul’s own reversion to the One. This explains why the mind also intertwines cataphatic and apophatic mystical discourses, as it spirals between unity and multiplicity. This analysis has the advantage of bringing added coherence and realism to St. Dionysius’ metaphysical and mystical doctrines. Key Words: Dionysius, Cataphatic, Apophatic, Affirmative and Negative Theology, Henosis. Link to full article on PDF on Tópicos website. Copyright © 2005-2018 Ite ad Thomam. All rights reserved. Powered by Blogger.